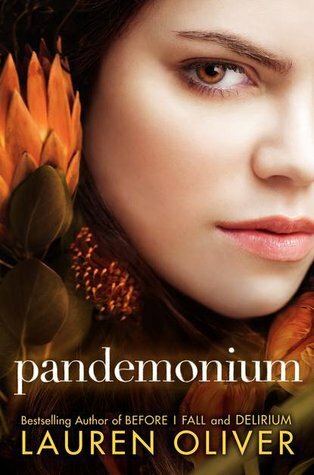 Blurb: Hard to follow and connect to, Pandemonium falls far short of the bar set by Delirium. Review: I spent a lot of time debating whether to give this book 3 or 2.5 stars. There were so many things that bothered me. I loved Delirium, and I don't think this one is just suffering from "second-book syndrome." It's more than that. I just honestly didn't like it. For one thing, each chapter changes flips back and forth six months. This made it pretty impossible for me to connect to the story. Every time I started to feel for the characters in one timeline, I'd be pushed into another and it just frustrated me. I think that if this story had been linear, I would have liked it A LOT more. I feel like she was trying to put two separate books into one, and she didn't need to. Next was the "love" part of the story. This series is based on the idea of love being a disease, so you know somebody's going to fall in love. I won't tell you who for risks of spoilers. But I will tell you that their "falling in love" seemed trite, rushed, and was clearly just something to create tension that didn't really need to be there. I didn't understand why the girl was falling in love with this guy, and vice versa. It was a very... hormonal love, I think. Desperate, almost. Blah. And there's a "twist" at the end that I totally saw coming, even though as I read the book I kept saying "no. Please no. Not that." Because it was CHEAP! I found myself saying "Oh puh-lease!" I had hoped this series would be more original than that. Not to say that it won't cause some interesting conflict in book 3, but I would have been MORE interested to see how the author had moved on WITHOUT this choice. And just as a side note, these characters don't know the following words: poop, crap, dung, feces, droppings, excrement, etc. The only word they know is s***. And that drove me nutso. And there was one (maybe two) f-bombs. So all-in-all, not much love. Definitely fell short of Delirium. Will I read the third one? No. This book kind of killed any love I had for the characters. Sad this one didn't work for you! I loved Delirium so I had really high hopes. Maybe I'll like it better if I go in knowing not to expect much. I definitely agree with a lot of what you're saying but for some reason I still really enjoyed the book. The "twist" at the end was inevitable and the love story was rushed - but I still enjoyed it. Funny how that works sometimes - people can think the same thing but can react differently. I appreciate your honesty. Good review! Just finished the book, and overall I really liked it, even though I agree with a lot of what you said. The thing that bugged me the most was the swearing - just that one word over and over again. It was everywhere throughout the book. And not just as a cuss word (something you say when you're upset about something) - the characters were actually talking about poop. A lot...mouse poop, rat poop, bird poop, etc. I know! They weren't mad, that's just what they called it. Drove me crazy!